The key quality requirements for the supply chain quality included in Crossrail contracts were over and above the industry norm and were intended to ensure that contractors were resourced correctly and established systems to deliver quality. This case study covers the quality resources and systems used in Crossrail, the supply chain requirements within the contracts, management of quality during construction, the self-certification process implemented and the quality culture across the programme. This case study is applicable to other major construction projects developing their quality management strategies. It is also relevant to main contractors and SMEs in providing good insight into what clients may require on future major projects. The information provided to Tenderers by Crossrail as part of the bid and subsequent contract arrangements included the Works Information (WI) of which the following sections outlined the requirements for Quality Assurance, Certification and Records and Document Control. These requirements were not written specifically for Crossrail but were a modified form of those previously implemented on the Channel Tunnel Rail Link. Crossrail is a self-certifying project, i.e. the Tier 1 Contractors are responsible for the implementation and maintenance of a management system that is capable of demonstrating that all the requirements of the contract and all relevant standards, regulations etc. are being met. Compliance to the requirements of the Works Information sections detailed above is intended to ensure that the Tier 1 Contractor’s management systems are sufficiently diverse and robust to ensure that they are capable of self certification. They also ensure that there is a large element of consistency between the management systems employed by the Tier 1 contractors across the project. The WI requires the submission of the Quality Plan within four weeks of the starting date, which in many cases was found to be impractical and so a level of pragmatism was applied. The WI includes significant guidance on the structure and content of the Quality Plan and also identifies the key areas for which QMS procedures must be provided. In order to be consistent in the review of Contractor Quality Plans across the project, a standardised checklist was produced/implemented to ensure that the WI requirements were consistently captured within Contractor’s QMSs. Contractor’s QMS procedures were submitted for acceptance, again to make sure the relevant WI process requirements were captured. The majority of the Crossrail projects were awarded to Joint Ventures (JV). In these cases, the QMS of one of the JV parent companies was used as the lead or donor system for the development of the Crossrail bespoke management system. In order to ensure that the bespoke Crossrail QMS procedures remained covered by the identified parent company’s certified ISO 9001:2008 QMS, all Crossrail bespoke QMS procedures were signed of by the relevant Company Quality Manager. With Contractors implementing bespoke QMSs, specific training was required to ensure that all operatives understood the revised processes. This was particularly true for JVs where some of the staff had no history of previously working to the lead company’s standard QMS. Training was done collaboratively with the Crossrail Quality Team presenting the WI requirements and the Contractor’s Quality Managers (QMs) explaining how their QMS would to be implemented to meet these. Due to the length and changing scope of the main Crossrail projects (in excess of five years in many cases) it was important for this training to be repeated in order to capture new starters, etc. With the Contractor’s extended supply chain organisations responsible for much of the delivery of the works, including the supply chain organisations within the training programme is essential. Another essential step to ensure the successful implementation of these bespoke QMS systems was for the Contractors to undertake robust internal audit regimes in the early months of a project to verify that the accepted QMS procedures were in place and functioning effectively. Identified inadequacies in the Quality Management System not being resolved in a timely manner. To date on Crossrail there have been instances of Cls 20.9 Notifications being issued. A staged approach to each issue was taken. Firstly, a Project Manager’s Communication (PMC) was issued identifying the relevant deficiencies and giving a defined period for their remediation and including a statement that a formal Cls 20.9 Notification will be issued if the PMC was not adequately addressed. If the actions taken in response to the PMC were deemed inadequate then a formal Cls 20.9 Notice would be issued under cover of a Project Manager’s Instruction. If following notification by the Project Manager of an ineffective Quality Management System, the Contractor fails to correct the Quality Management System within one week of receipt by the Contractor of the notification, the Project Manager may either implement his own quality management regime on the works to correct the quality system or instruct the Contractor to stop or not to start any further works until inadequacies are fully addressed. In such circumstances the Employer shall recover any abortive costs incurred from the Contractor. In reality, Crossrail never took the implement his own quality management regime option as it would have been too resource intensive to do so. Instructions to stop work were issued. However, the normal response to the issue of a Cls 20.9 Notification was for the Contractor to develop, for Crossrail acceptance, a documented Quality Improvement Plan QIP identifying the SMART actions to be implemented to address the identified deficiencies. Once accepted, the requirements of this plan were tracked to closure at which time the associated Cls 20.9 Notification could be closed. A lesson learned regarding the implementation of the Cls 20.9 process was that often the issues outlined in the Cls 20.9 were not disseminated to Contractor’s senior management remote to the project and therefore the high level support required to resolve the associated issues was not always forthcoming. In order to address this, a practice was established whereby the Crossrail Technical Director issued a letter to the Contractor’s senior responsible Director notifying them of the issue of the Cls 20.9 Notification and requiring them in person to present their QIP to Crossrail. This simple practice had the effect of elevating the issue to a sufficiently senior level of management with authority to ensure the issues were resolved. The Crossrail WI recognises that without adequate and competent resource, even the best formulated QMS is unlikely to be implemented in a robust and comprehensive manner. This applies equally to the Tier 1 Contractors’ organisation but also to those of their supply chains. be a competent auditor or have access to competent auditors. The Crossrail Tendering process required that the CV of the identified QM candidate be submitted for review as part of the Contractors’ submission, the review of this CV was a defined part of the tendering scoring process. The Quality Manager was also formally accepted post award. In reality, as the award of the various Crossrail contracts progressed, it became apparent that the industry as a whole was struggling to source sufficient candidates that met these requirements. This lack of resource was the prime driver behind the Crossrail/CQI Quality Course which was designed to meet the educational requirements for candidates to achieve, dependant on having suitable experience, Membership of the Chartered Quality Institute. Further details of this course are available in a separate Learning Legacy Case Study. In addition to the Quality Manager requirement the WI also requires for there to be a dedicated resource for certification (see below). Subcontractors and suppliers of any tier supply a quality presence with adequate resource and appropriate authority to ensure the quality of work on the contract. The Contractor shall provide its own and its Subcontractors’ and suppliers’ organisation charts. The charts show the reporting structure of the key persons and other management and supervisory personnel on the contract and the reporting lines for both quality assurance and quality control personnel. In addition to requiring acceptance of materials to be used in the Works, the WI also stipulates the use of suitably certified sources of supply. However, although this requirement is all encompassing, it was applied on a risk assessed basis dependant on the scope of supply of the supply chain organisations. The WI also makes the Tier 1 Contractors responsible for providing appropriate training to all personnel in the operation of the QMS, this requirement extends to their supply chain organisations. The quality and certification requirements of the WI are more demanding compared to most other projects in the construction industry. During the life of the project, it has become apparent that supply chain organisations new to Crossrail do not fully appreciate the full scope of the WI requirements and if this is not rectified they tend to revert to/continue exhibiting quality behaviours established on previous projects. Therefore, in a similar manner to the training of their own staff (see above) it is vital that the Tier 1 contractors provided to all their supply chain partners adequate training on the WI requirements and on the operation of their own QMS as early as possible post award. Recognising the importance of this, the Crossrail Quality and Certification Team produced and presented a specific Supply Chain Works Information Briefings to which the Tier 1s could send representatives from their supply chain partners, either pre award or as soon as possible post award.. It was thought that hearing the WI requirements presented directly by the Client organisation would have more impact than if presented by the individual Tier 1 contactors. These briefings were held on a 4 weekly basis and were open to all. The Contractor shall demonstrate that adequate resources are provided to fulfil the requirements for quality management, inspection & testing and self-certification as detailed in this schedule (the WI). This appears to be a powerful requirement. In reality, if implemented it was only done so retrospectively in response to an identified quality related deficiency, often combined with the issue of a Clause 20.9 Notice of an Ineffective Quality Management System (see above). The influences of the WI on the application of construction quality are many and varied. However, if the materials used in the construction process are assured, the installation process controlled and documented and any non-conformances identified and tracked to acceptable closure, then the overall compliance of the construction process will to the greater part also be assured. This section will therefore concentrate on how the WI influences these three assurance streams. The WI contains significant measures for the assurance of materials used in construction. The Contractor shall utilise the template attached in Appendix J (the Materials Compliance Record (MCR)) for the purpose of recording material and product acceptances for the works and submit such records to the Project Manager for acceptance. This requirement was somewhat relaxed during the project to allow the Project Manager to agree which of the Material Compliance Records are required for formal submission and acceptance (i.e. MCRs for low risk materials were not submitted for Crossrail acceptance, however, as self-certifying entities, Contractors still had to prepare MCRs for internal approval). Unless otherwise accepted by the Project Manager, Plant and Materials forming part of the permanent works or temporary works incorporated into the works shall be procured from sources that hold appropriate certification from a United Kingdom Accreditation Service (UKAS) accredited certification body (or one that has mutual recognition with UKAS). It should be noted that this clause excludes the use of sources of supply who may hold ISO 9001:2008 certification from one of the non UKAS accredited certification bodies that exist in the UK and elsewhere. It has always been Crossrail’s message that the Inspection and Test Plan (ITP) is the key document for installation and the corner stone of the overall certification process. certification/documentation/records to be generated in support of the inspection and test activities. The use of ITPs on Crossrail is all encompassing, including all activities undertaken by the Tier 1 contractor and also by their supply chain both on and off site. The WI also stipulates that no activity can start (again either on or off site) prior to the acceptance of the associated ITP. The Contractor and his subcontractors and suppliers of any tier engaged in supplying, manufacturing, construction, installation, commissioning and testing or any other service connected with the works, shall maintain ITPs appropriate for the services they provide that are accepted by the Supervisor. The Tier 1 Contractor is also required to maintain a schedule of ITP submissions with a record of the status of review and acceptance. The requirements regarding ITPs were subject to very close scrutiny and starting works without an accepted ITP was deemed a major issue and was measured as a high level KPI. In truth, even with this scrutiny works starting without an accepted ITP in place was a reasonably regular occurrence, initially during the initial stages of projects where the correct quality culture was being established and then again as the amount of works delivered, both on and off site, by the Tier 1’s supply chains increased as projects progressed into the fit out and MEP phases. In order to minimise such occurrences, this issue was subject to continuous review at senior level Crossrail/Contractor meetings and a series of workshop meetings held to identify best practice within the Tier 1 Contactors in order to disseminate it across the programme. This issue was also managed by the Cls 20.9 Notice of Defective Management System process described above. It should also be noted that the ITPs were used to positively identify, during the acceptance process, the inspection and test records that the Tier 1s would need to provide as deliverables to be collated into distinct certification packages required to demonstrate compliance of the works. To enable Crossrail to judge the likelihood of the ITP deliverables to demonstrate installation compliance, no ITP could be accepted unless the detailed inspection forms/checklists were appended to the ITP and reviewed as part of the acceptance process. Crossrail acknowledged that even with all the installation controls in place, things could still go wrong, hence the need for a robust and comprehensive Non-conformance Reporting (NCR) process. Unless otherwise accepted by the Supervisor, the Contractor shall enter each NCR, including sub-contractor NCRs, in the PTR system. Where a Defect in a works item is noted that cannot be put back in compliance within the same shift the Contractor shall raise a NCR. Where a specified work activity has not been carried out in accordance with agreed procedural requirements, a NCR is raised. The main strength of mandating a project wide NCR system is that there is always a clear trail to closure which is always controlled by and visible to the Crossrail Team. Another benefit is that Crossrail now have probably the largest body of NCR data available within the UK construction industry. This has allowed on going analysis of NCRs trends that can be used to implement directed corrective and preventive action across the project. During the project Crossrail have developed a weekly NCR report that has proved of great value in cascading NCR information across the project. Crossrail operate probably the most robust and visible certification process employed on a major UK Infrastructure project (and was based on the good work and processes employed on the CTRL project). Progressive assurance means that there will be continual confirmation of compliance by the generation of contemporaneous records. This package structure was supported by a mandated series of certificates that allowed packages of work to be accepted progressively from initial ground works through to the signature of the Whole Contract Completion Certificate at the end of the contract, an example of the package hierarchy is shown in Figure 2. The certification process applied through all stages of construction including design manufacturing, construction and test and commissioning. All certification documentation was formally submitted for acceptance via the mandated project Electronic Data Management System (EDMS). Best practice was the use of collaborative weekly/bi weekly certification meetings at which live packages were reviewed for completeness with the aim of only uploading packages formally to the EDMS once they were acceptable. The amount of planning and resource required to successfully apply the Crossrail mandated certification process cannot be under estimated. Training on the process was provided by the Crossrail Quality and Certification Team not only to Crossrail and Tier 1 personnel but also to the wider supply chain companies (who have a major role to play). 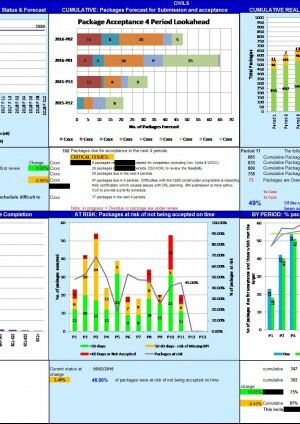 Crossrail developed a comprehensive tracking schedule for certification package completion including the provision of monthly Certification Dashboards for the project (see Figure 3 for an example) and also for individual contracts. This reporting not only provided data on current status but also provided a look ahead of workload for the next four periods. At the time of writing it is predicted that there will be at least 5000 individual packages required to certify the project. In reality, as the package breakdowns for the MEP Installation and Test and Commissioning phases are not fully developed it is likely that this number will increase to in excess of 8000 packages. Crossrail and the Tier 1 Contractor’s have always tried to manage the quality assurance process collaboratively. This can be demonstrated by the meeting and training strategies developed over the life of the contract. Wherever possible the meeting was preceded by a site tour during which quality issues were identified for later discussion at the QFM. To prevent the QFM simply being a meeting between the Crossrail and Tier 1 quality teams, attendance from both Crossrail (e.g. the Project Field Engineer, Project Manager, etc.) and Tier 1 construction management (e.g. the Project Manager, Construction Manager, etc.) was mandated. Crossrail developed and mandated the use a standard QFM KPI spreadsheet that was updated by the Tier 1 contractor for each QFM, see example in Figure 1. This, with experience, could be used by the Crossrail quality team to provide a quick and comprehensive overview of the “QA Health” of a contract and be used to focus discussion at the QFM. These meetings were a method of ensuring that quality related issues were identified, documented and tracked to satisfactory closure. Quality culture was also encouraged by the training provided, free of charge, to Tier 1 Contractor’s own and supply chain staff. This included two externally provided courses run by the Chartered Quality Institute (Managing Quality on Site – a half day course for Supervisors) and the British Quality Foundation (Root Cause Analysis – a full day course) plus numerous training sessions on the implementation of the Works Information, Inspection and Test Plan production, etc. presented by the Crossrail Quality and Certification Team. For future projects the following aspects should be considered based on the experiences of the Quality and Certification Team at Crossrail. Guidance Notes – the implementation of the WI must be consistent across the project. This was enabled by the production of guidance notes on issues such as ITP management, the QFM process, Certification, etc. Training – again, in order to provide better understanding and consistent approach, training was found to be of vital importance. This was generally delivered by Crossrail staff in conjunction with the Tier 1 Contractors and was extended down through the Tier 1’s supply chains as necessary. It was as important to train the Crossrail staff, as being a major project with extensive staff, Crossrail’s own organisation was obtained from many sources. In some instances lack of a consistent approach to Crossrail’s acceptance of ITPs between projects caused issues when these ITPs were shared between contracts. Due to the length of the project the training provision needed to reflect the continual changes to Crossrail, Tier 1 staff and supply chain organisations as the project moved through the various construction phases. Deliverable Scheduling – as the project progressed particularly into the supply chain delivery stage (building, architectural, MEP, etc.) it became apparent that the Tier 1s were having difficulty in clearly identifying the key deliverables (ITPs, MCRs, etc.) that were required for submission and acceptance prior to the commencement of the associated works. This was particularly true with the definition and management of Prototypes, Benchmarks and Samples, making benefits from sharing between contracts difficult to achieve. This led to an increasing trend in NCRs being raised due to lack of accepted documentation prior to commencement of works. It was identified that the responsibility for this scheduling must lie with the Package Managers within the Tier 1’s construction teams and not with their Quality Manager/Team. In order to be sufficiently agile to reflect schedule changes, these schedules needed to be based on the 1 to 3 month construction look ahead programmes as opposed to the formal accepted P6 programme. The resolution of this issue was facilitated by identifying examples of Contractor best practice with regard to schedule management and sharing this across the Project. Quality Improvement –due to the length of the project, it was essential that quality improvements were identified to address the many and varied issues that occur during the various construction phases. These improvements were best captured in one Quality Improvement Plan (QIP) per contract. These QIPs were submitted for Crossrail acceptance and were required to identify SMART actions with hard and well defined success criteria. As the project progressed, completed actions were required from the QIP and new ones added as required.